The journey to rehabilitation and restored health is different for every person. At Aperion Care, we approach this journey with pragmatism and compassion. This blog details some of our processes and some insight gleaned from an interview with Lynn Sulzberger, Occupational Therapist and Regional Rehab Director for Renewal Rehab, who oversees the therapy departments at seven Aperion Care facilities. What is the Aperion Approach? Aperion Care begins every guest with an interdisciplinary plan for care. 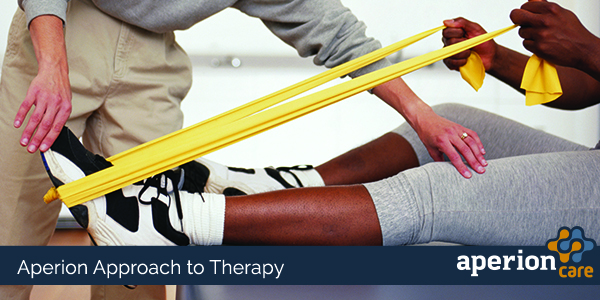 The therapy staff works under the guidance of an overseeing physician to determine the best course of action. The therapists work in conjunction with each other and with the nursing staff to monitor progress, identify further areas of need, and adjust the plan as necessary. Families are often involved in the care planning for guests, meeting with the care team and staying as involved as they would like to be. The goal is to restore guests to the highest level of functioning and confidence possible. There are three main types of therapy offered at Aperion Care facilities. Each addresses a different need or deficit that guests may be experiencing after an illness, injury, or accident. Not every guest will need to undergo every therapy. Physical Therapy focuses on strength, balance, and ambulation. The goal is restoring lost movement ability. Speech Therapy focuses on speech, memory and cognition and swallowing issues. The goal is restoring lost or damaged speech. Occupational Therapy focuses on daily living skills. The goal is re-entering the community and ensuring a smooth transition to the home. I had a patient and all he wanted was a hamburger from McDonald’s. We needed him to work on walking. So we took a walk two blocks to get a hamburger. Many patients have just lost control over everything in their life because of being sick, so if they can have control over one thing that means so much to them. She also noted that the most rewarding part of her job is her relationships with guests. She loves seeing them happy and helping them heal.